As moms and teachers, we want to give our children information that will help them develop into healthy adults – physically, emotionally, and spiritually. The Treasures of Healthy Living Bible Study comprehensively examines health from a Biblical perspective that’s supported by research, as well as showing the links between physical, emotional, and spiritual health. The Teacher’s Manual is a companion to the Bible Study that guides parents and teacher’s as they teach the treasured principles. There are twenty-four student lessons that include activities for students of all ages, discussion starters, and fun ways to practice what’s learned and pass it onto others. 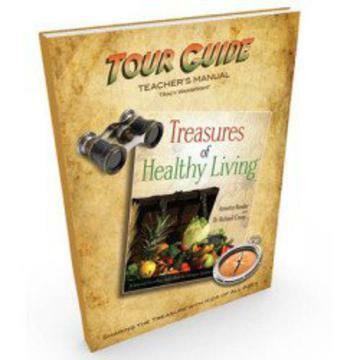 Teaching High School Students: We suggest using all three books: Bible Study, Nutrition Manual and the Healthy Treasures Cookbook along with the Leaders Guide instead of the Teacher's Manual. This collection will count toward Science, Nutrition, Health and Bible. It is a very concentrated program with learning and application very doable for these students. Your students will learn on a high school level information that will prepare them for life and college. This study is based on a total Biblical Worldview.